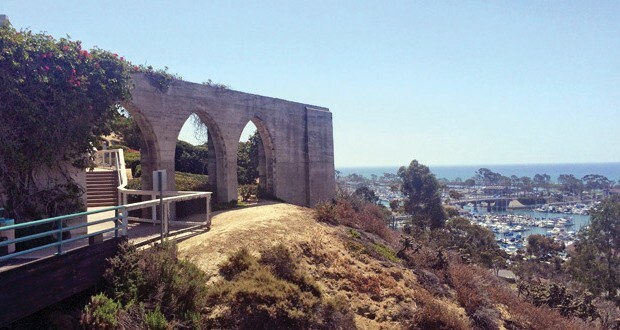 The Bluff Top Trail provides a spectacular view overlooking the Dana Point Harbor and the Pacific Ocean. As the song says, “There ain’t no cure for the summertime blues.” Forget the grammatical issue with that line (though “ain’t” is now in dictionaries). There really are many ways to remedy this seasonal malady. I know, “malady” is an old-fashioned word, but in the cycles of life, everything old is new again. As our culture forgets (or intentionally ignores) history, it’s easy to bring back a long-forgotten product or idea, dress it up really purty as something new and innovative, and a new “genius” is born. People don’t know what they don’t know. It’s part of life’s cycles of activity, right? Or maybe it’s summertime blues messing with my head again. At this time each year I remember all of the things I planned on doing before Labor Day, but alas (another good old word), not so much. Best-laid plans, etc. Then I frustrate myself by not carving out enough time to relax, read and refresh. I’m realizing this will be a constant personal challenge. Recently I was sitting on a bluff above the beach in the Dana Point area, taking a break from speaking at a conference in a nearby hotel. I made it a point to skip looking at the phone, or iPad, or reading for a few minutes. I just focused on the endless blue ocean and listened to the surf. The more I sat still, the louder it became, and its rhythm was almost hypnotic. My mind drifted to random places as waves became a soundtrack for my thoughts. For whatever reason, I soon reflected on how America has lost a sense of childhood wonder … and how our kids are pressed on all sides to get past their innocence, way too fast. Suddenly there was a mental image of an old photo I found recently. It was my Mom and Dad, way back when, before they were married. 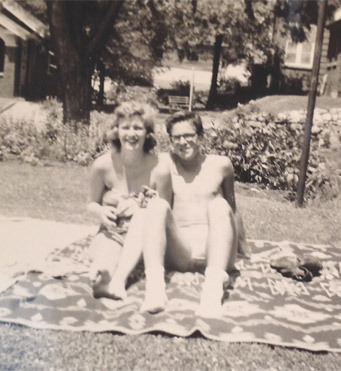 They looked so young, so full of energy and affection, just sitting on a blanket, sunning themselves in summer wear, at my grandparents’ home. Right there in a hot, humid Rockford, Illinois backyard. They didn’t need an ocean, a resort, an iPad, cell phone or anything, really. Just each other. They had no idea then that in the years ahead I would arrive, then a sister, then twins (brother and sister). While my parents would separate years later, today we all remain close anyway. A very good thing. Innocence. Everything was simple, and optimistic and wonderful back in the day. My mind then contemplated Grandma and Grandpa Larson’s old house on 19th Street. It stood proudly, above and to the right of where Mom and Dad sat on that hot blanket. As the sound of the waves on the Pacific massaged my brain, I could remember the layout of the place. Every room, the furniture, the smell of homemade bread… and Grandpa’s wood saw in the basement workroom where he created my outdoor playhouse, plank by plank. I could almost hear the voice of Grandma and her sister “Gunny” going back and forth about how to take the next step in a recipe they were working on, while keeping an eye on what the neighbors were up to across the street. I guess you can go home again, even to a home they left decades ago. I was amazed at how much I recalled. The sea breeze blew and the surf sounds made me feel as if I was the only person there on the California coast. Then I was suddenly remembering the comfort and security of a summer weekend visit to Grandma’s. Nothing like being cozy in bed in the morning as the sun rose, birds chirped and, in the distance, the sounds of local industry coming to life. My hometown was a huge machine tool center then, and there was a steady rhythm of the factories that sent a message like this: It’s OK. The economy is humming along, everything will be OK. That, and the sound of trains lumbering through town were like sweet, steadying music for me. Who knew then what the future would hold for Rockford and that now mostly lost industry. So much has changed, and often not for the better. But it all lives on in my memory, and time won’t change that. It took the sounds along our coast—with no other daily distractions—to give me one of the best lessons of this summer. I was reminded again that everything old is still important, and as life speeds by it’s a good thing to occasionally go back and take a mental walk through the past, connecting with our roots, and finding encouragement and joy to fuel the future. Larson is a veteran Southern California radio/television personality and media consultant. His voice is heard on KPRZ 1210AM, and his weekday talkshow airs 6-9 a.m. on KCBQ 1170AM. Learn more at www.marklarson.com.